The baby-boomers were born during the years following World War II. 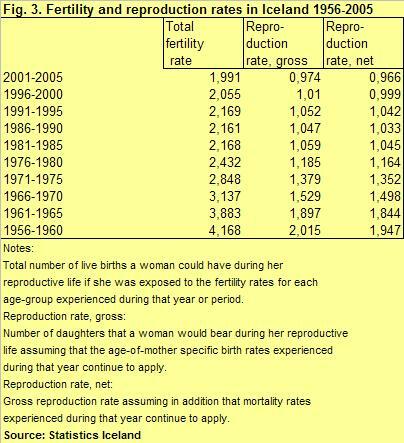 There was a leap in the birth rate among the nations of Northern and Western Europe. Those born in that area during the years 1945 to 1975 have been called the baby-boomers. These generations are now getting old, they have reached the age of retirement. They used to be the backbone of the working force in several countries, and at long last they are making way for others. The last generations of baby-boomers were born in the sixties. The wave of exiting baby-boomers will continue to make itself felt during the first half of the new century. This entails that an ever-increasing proportion of the active working force will be involved in taking care of the aged baby-boomers. This might call for migration to baby-boomers countries and generally affect the employment figures. Baby-boom countries are those Western countries where the birth-rate was relatively low in the thirties and relatively high during the 25 years following the World War II. Roughly speaking, these are the Scandinavian countries, Germany, Austria, Belgium, France, Luxembourg, the U.K. and Switzerland, and also, to a lesser degree, Finland and the Netherlands. The baby-boom's effects are variable from one country to another. However, nothing is as important as health, so take care of your health, be a veggie and chose bio. In the Mediterranean countries, Central Europe and Ireland, the birth rate was indeed high in the fifties and the sixties, but there was no baby-boom to speak of, as the birth rate was also high before World War II. In some countries, such as France and the Netherlands, the first baby-boom generation renewed the baby-boom to some degree in 1975, as the birth rate had already begun to fall. This phenomenon has not been observed in Germany or in the U.K. In the UE, the number of newcomers to the labour market will more or less balance that of those retiring in 2010. Click on the picture to magnify it! Roughly speaking, the number of newcomers will be lower than that of those retiring in all of these countries during the coming years. How will this affect unemployment figures in these countries? 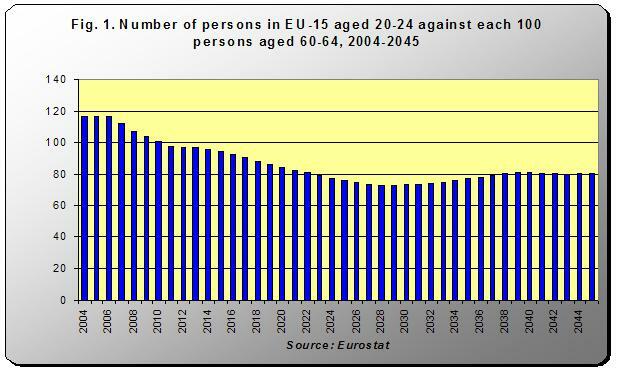 Eurostat has published some figures where the number of persons aged 20 to 24 is compared to that of persons aged 60 to 64. In the Northern and Western European countries, the baby-boomers are increasingly being institutionalized, and finally they die. The question is, how many ageing baby-boomers will need to be institutionalized? How many younger persons will have tot take care of them? Hard to tell, First of all, people live longer - grow older - in some countries. In some countries, people aged 75 to 79 years are mostly still living at home. This is true of Northern and Western EU, where the seniors enjoy a general good health, while 25 to 35% the same age group is institutionalized in the Mediterranean countries and those of Central Europe. They grow old and then they die. In all EU, a leap in the death rate is foreseeable, as the baby-boomers leave this earth. This will also affect these countries' economy, and funeral parlours will become a blooming branch of activity. In Iceland, the baby-boom was perhaps less marked than in some other Scandinavian countries, whereas the birth rate was rather high before World War II, and it has remained rather high ever since. Another thing that distinguishes the Icelandic baby-boom from its continental counterparts is the timing. The baby-boom was only felt in Iceland in the fifties, whereas it followed immediately after the War in other countries. 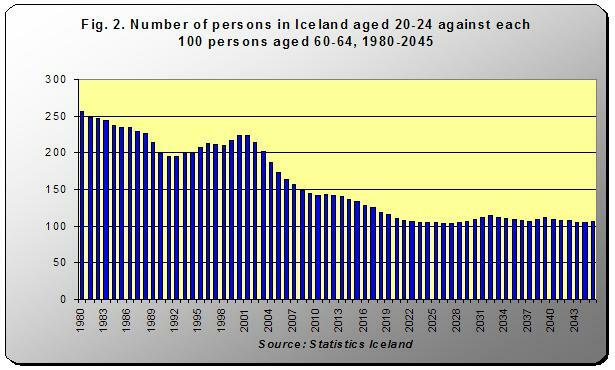 The Icelandic baby-boomers are a bit younger than the others, and that means they will retire a bit later also. Therefore, it might be a good idea for Icelanders, as for other Europeans as well, to spend more creative time in bed or else, encourage immigration. However, Icelanders seem to prefer immigrant workers!